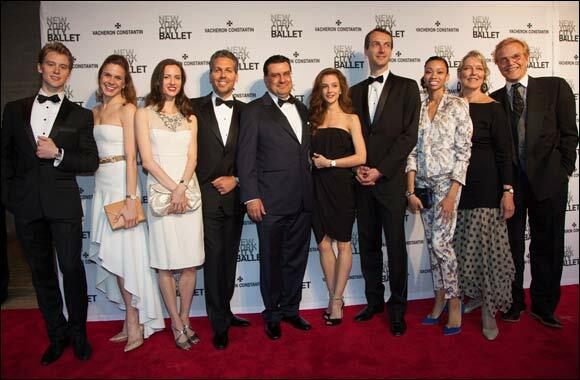 May 2014 (New York, NY) – Vacheron Constantin, the world’s oldest watch manufacturer with almost 260 years of uninterrupted history, sponsored New York City Ballet’s 2014 Spring Gala for a second year on the evening of May 8th. The Gala commemorated the 50th Anniversary of the opening of the David H. Koch Theater (formerly the New York State Theater), and the Company’s residence at Lincoln Center. Juan-Carlos Torres, Chief Executive Officer of Vacheron Constantin, was the evening’s Corporate Chairman. Honorary Chairmen Julia and David H. Koch, along with Gala Chairmen Liz and Jeff Peek, Carol and Earle Mack, and Ide and David Dangoor were in attendance. The evening’s guests included actress Kristin Bell, singer Alicia Keys, and movie director Baz Luhrmann. In celebration of the evening, Vacheron Constantin unveiled three new one-of-a-kind additions to its Métiers d’Art Hommage à l’Art de la Danse collection, created by master enamellers and watchmakers in the workshops of Vacheron Constantin. The watches are each inspired by a different masterpiece by French artist Edgar Degas, who depicted ballerinas using different techniques, including sketching, painting, and photography. Each watch features exclusive Grand Feu grisalle enamelling and bears the prestigious Hallmark of Geneva. The evening began with a private reception held by Vacheron Constantin, followed by the performance. Program highlights included works that were featured at the theater’s inaugural Gala in 1964: George Balanchine’s Allegro Brillante, and Igor Stravinsky’s Fanfare for a New Theater. Guest artist Kristin Bell performed an excerpt from the musical Carousel. A highly-anticipated world premiere ballet by choreographer and NYCB soloist Justin Peck and composer Sufjan Stevens concluded the program. After the performance, guests dined and danced by candlelight on the Koch Theater’s Promenade. NYCB’s Ballet Master in Chief Peter Martins welcomed the 1,100 dinner guests with a speech expressing his gratitude to the Gala Chairmen and Vacheron Constantin for their generous support. Twelve principal and solo dancers from New York City Ballet delighted the guests by wearing Vacheron Constantin timepieces during the Gala.